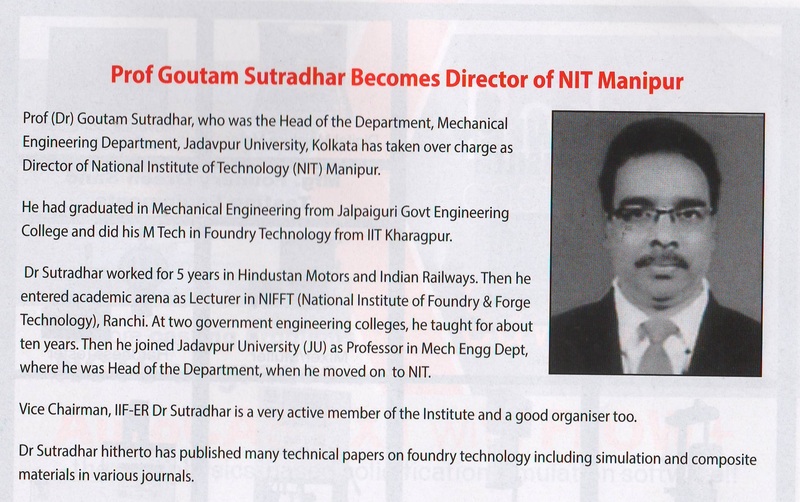 The Institute of Indian Foundrymen Congratulates Prof. (Dr.) Goutam Sutradhar for his appointment in NIT Manipur as Director. Dr. Chandi C. Malakar's research was recognised as best poster award in National conference (NIICT) held in CSIR-IICT Hyderabad in 2016. Dr. Chandi C. Malakar's research was recognised as best poster award in, "National Symposium on Advances in Chemical Sciences at Assam University, Silchar on 11-12 January, 2017". Dr. Chandi C. Malakar's research was recognised as best research paper award in, "5th Annual International Conference on Chemistry, Chemical Engineering and Chemical Process (CCECP 2017), Singapore, March 6-7, 2017." Dr. Chandi C. Malakar's research was recognised as best poster award in, "National Symposium on Contemporary Facets in Organic Synthesis (CFOS 2017), during 22-24 December, 2017, IIT Roorkee". Dr. Chandi C. Malakar received a GIAN course entitled "Novel Platform on Organocatalysis – Since & Then" in June 2018. The date of the course will be updated soon - Course coordinator: Dr. Chandi C. Malakar, Foreign Faculty: Prof. (Dr.) René Wilhelm (University of Paderborn, Germany). Dr. Anil Kumar Birru received a GIAN course entitled " Fabrication and Characterization of Nano Hybrid Composites and Ceramic materials and its Impact on Mechanical, Tribology, and El"